The IPU Bariatric Shower Commode Chair with arms is made heavy duty to hold up-to 550-pounds. There is 24” between the arms to accommodate larger individuals comfortably. It has a comfortable mesh backrest. It rolls on 5” heavy-duty casters (all locking). It has an anti-tip design to help provide safe transfers. 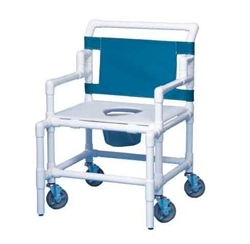 It features a high-density polyethylene flat seat with larger seat hole opening.